Compatible with XtremeLink®, Futaba SBUS/SBUS2, Spektrum satellite, JR DMSS X-Bus (Mode A & Mode B), Graupner HoTT SUMD, JETI UDI, and Multiplex SLRx receivers! The X24 is the big brother to our popular X10+ Chanel Expander. This device is an integrated flight control system and performs the functions of a power expander, channel expander, voltage monitor, and failsafe system for different types of receivers that output a serial data stream. So, XPS Nano, Nano II, & RFU, Futaba SBUS/SBUS2, Spektrum satellite, JR DMSS X-Bus (Mode A & Mode B), Graupner HoTT SUMD, JETI UDI, and Multiplex SLRx receivers are all supported! ALL types of servos are supported! You don't need special and expensive servos! Up to four receivers can be used with all supported systems! 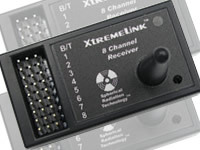 The connection between the X24 and each receiver is made using a single cable connection. We offer several lengths of our UltraTwist cables which offer the easiest routing and highest immunity to RFI/EMI. 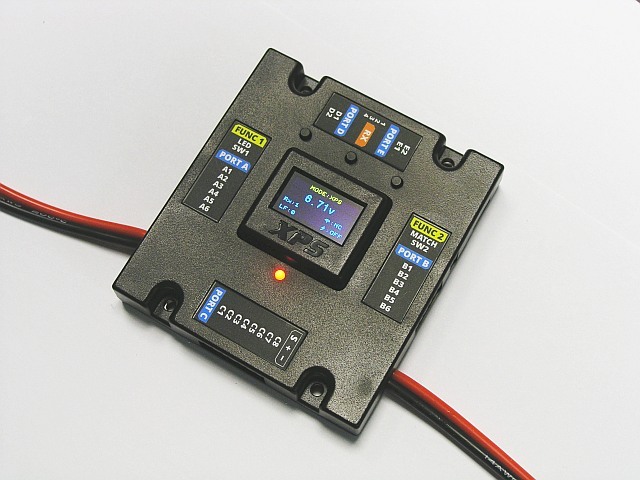 The X24 has dual sets of heavy duty (16awg or 14awg wire) power inputs, allowing you to power the servo bus properly! Each input can handle up to 100A of current! So, it is more than sufficient for powering servos! Keep in the mind that the power going into the X24 is the power also coming out of it. The input power is NOT regulated. So, if you plan to power your setup using a 2S Lipo, MAKE SURE that your receiver and servos can handle a 2S Lipo setup! There is NO voltage regulator for the receivers (with exception of the special Spektrum satellite receiver ports which provide 3.3v). Power Expander - provides constant (unregulated) power to all servo outputs from multiple battery sources. Typically over $250 by itself! Matching - you would need 12 JR MatchBox devices to equal the (manual) matching capabilities. 12 @ $69.95 = $839.40 value! High-end electronic switch - electronic switches allow a high current power source using a simple toggle, pin and flag, or push button switch. $50 value! Ignition BEC - used to replace batteries with ignition systems. There are dual BEC outputs on the X24! 2 @ $39.95 = $79.90 value! The X24 has optional current matching (X24 Deluxe). Just select a master and a slave servo, set the master's center and end points, and press the button! Just like magic, the slave servo is automatically matched for you using a highly advanced current positioning algorithm! Up to 12 sets of master/slaves can be current matched! Bad geometry, wrong length linkages, and servo differences are a thing of the past! The X24 has 16 individually programmable 3 stage sequencers. This means that you can sequence events like gear doors, flaps, canopy opening w/pilot waving - whatever you can dream up! The X24 has programmable voltage monitoring built in, similar to our popular TattleTale. The OLED screen also shows you the minimum and maximum voltages that the X24 see while powered on. Just like all XPS receivers, every channel output can be mapped for any receiver channel. So, you can assign outputs to make installations more convenient. You can also do things like have three rudder channels and set the centers and endpoints between them, or even reverse servos. You could fly a giant scale aircraft with three servos per wing, two servos per elevator half, four servos on the rudder, throttle, and ignition kill - all with a simple 6 channel radio! The X24 has a failsafe override (on by default). This means that it will ignore the failsafe of the receiver(s) and use it's own failsafe settings. If you don't have failsafe override enabled, then the receiver(s) will provide the failsafe control (which is of little use with systems that only have a throttle failsafe). With the failsafe override enabled, like every XPS receiver, you can independently set the failsafe for every single channel. There are three different failsafe types you can choose from: hold last position, user defined position, or signal off (handy for auto pilots that use a loss of servo pulse to trigger a return to home function). Every channel can have a different preset position, and it is done with our live active failsafe. Once the failsafe positions are 'locked' into memory, any channel that has had its failsafe type defined as 'user defined' will now go to that position when a failsafe occurs! Spektrum satellite receivers can be powered directly by the X24 through special ports. This provides 3.3v to any satellite receiver (instead of the normal servo voltage). This means you don't need the adapter cable commonly used with Spektrum satellite receivers to convert 5v to 3.3v. The X24 operates down to 2.1 volts! This is well below the operational voltage of ANY servo and ANY other brand of receiver (except ours of course!) So, the X24 stays fully operational in the lowest voltage conditions. 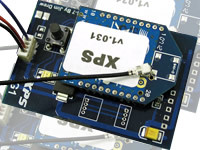 The X24 has a serial interface for our Serial Link. The Serial Link is a USB device that plugs into any USB port on a Windows PC. Windows 95 through 10 is supported. Special X24 control software is being created to allow programming all of the X24's features such as channel mapping, failsafe mapping, failsafe time, reverse servos, change end points (matching), etc. Customers with our XDP wireless hardware are already familiar with how this works. Of course, all options can be programmed by using the three push buttons and OLED screen. A flasher program exists now so that you can update the X24's firmware. Size: 3.6" x 3.8" x .650"
Click here to see the X24 manual. Note: these units are made to order! Select your wiring option below.